It doesn’t take long for Larry to want another adventure in life. He had back surgery on July 9th. 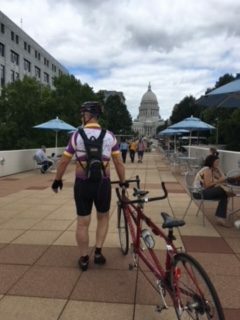 It was July 25th when we took our trailer up to Lake Farm Campground about 4-5 miles outside of Madison’s Capitol building. The weather was a bit windy but perfect for a bike ride pass Lake Mendota where we saw a class of scuba divers and many fishermen. At one point, we asked a woman the best way to get to the Capitol where we were going to stop for coffee. She said, “Just go around the bend and you will see a bike elevator to take you near the Capitol. A bike elevator I thought—how clever and thoughtful of the city to provide such a thing. Soon, I clicked this picture. After back surgery a few weeks ago, Larry rides the tandem with me to Madison, WI from our campground. If you are looking for a getaway that is close to Chicago and the suburbs, think about traveling to Madison. There are endless campgrounds and trails for biking and hiking. Being a university town, it has all the perks of entertainment to enjoy as well. We chose to go to Madison because we could camp right on the bike trail and it was flat for Larry to work on his therapy. It was a great step for Larry but his endurance and strength still has a long way to go. He took a long nap afterward to recharge. Formal physical therapy starts tomorrow. We hope to return to Lake Farm Campground or another nearby campground in the fall to enjoy the endless trails and to possibly take our kayak up to this wonderful outdoor-friendly town. We hope you can join us when Larry is in better health and has greater stamina. For more information, see www.visitmadison.com and sign up for their newsletter.